This is a big deal for us as space is at a premium when we’ve got all our camping equipment with us. 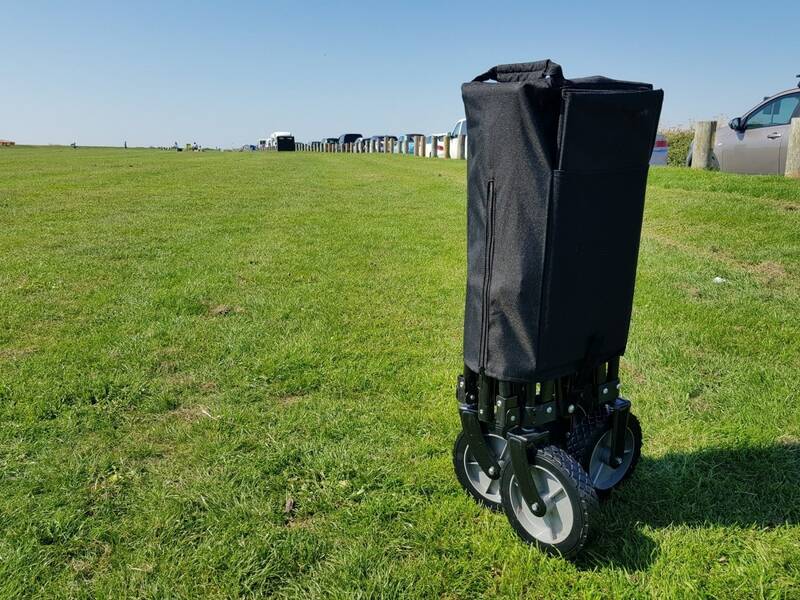 The Micro Wagon when folded stands independently, and is compact due to the carry case (which has a slot for the folded base board too). It reminded me of an umbrella-fold style push chair, and is simple to fold and unfold, taking only 1 minute to put up. 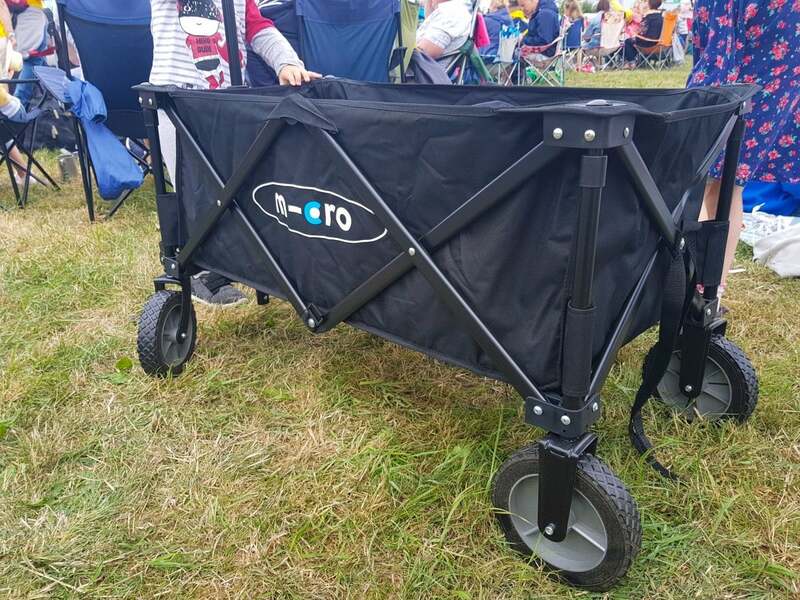 You just unzip the waterproof cover and remove it, take out the base (which folds) and then stretch the wagon out, and put the base in, extend the hand and you’re done! We stored the cover underneath the base when the wagon was in use so we didn’t lose it. When you’re out and about with the wagon but are stationery you can attach the handle into the bracket to keep it upright, and also un-extend it so it’s not in the way. This beauty is sturdy, a strong frame and high quality material mean it has withstood the kids clambering into and out of it over and over, then getting tired and being dragged in it, plus transporting our 8 man tent (which I can’t lift on my own!) without a wobble! The wheels are solid (but don’t need pumping) and wide. 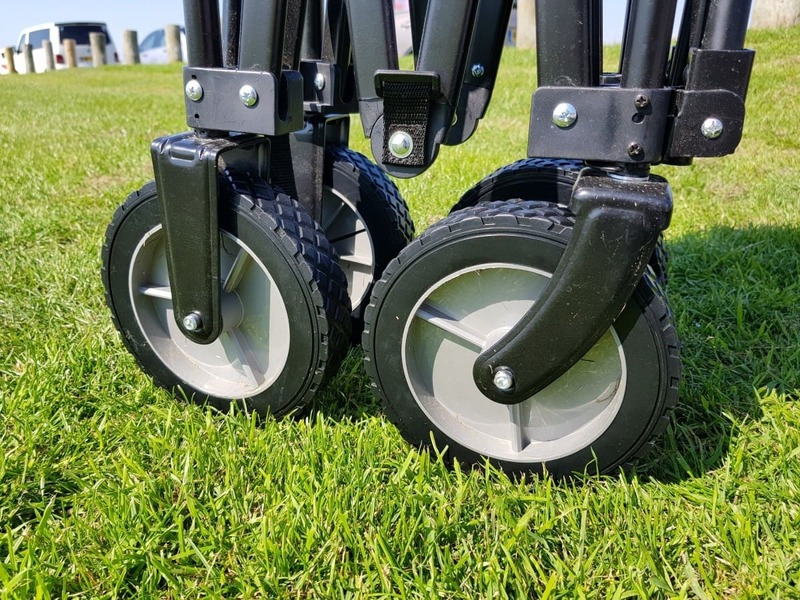 The previous trolley we bought lost a wheel nut on its first outing – plus it didn’t have a flat base inside so was not comfy for kids to ride in… then the next time we used it a wheel bracket buckled and that was that! In comparison the Micro Wagon is strong, with chunky wheels that made pulling it fully laden on wet grass a doddle, and I have no reason to believe that it won’t last years and years! It weighs 10kg when empty/folded. Our Micro Wagon actually lives in the boot of my Zafira because it gets used a lot for transporting things between the car and home. We don’t have a drive and there is no parking on our road so we have to park round the corner and depending on the time of day sometimes round the next corner too (thanks to an unrestricted parking zone and being right next to a commuter train station!) so when I arrive home with a full shop, both kids, their scooters/book bags and whatever else I whip the wagon out, load it up and off we go! A few people have stopped the tell how genius an idea it is too! 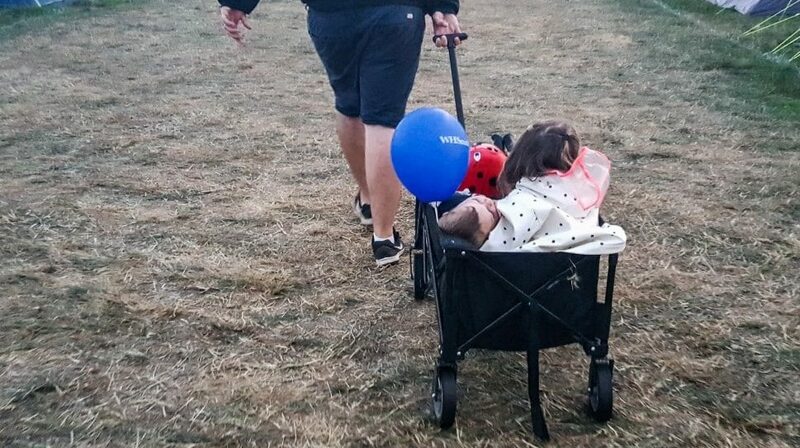 Of course it was amazing at festivals so we could cart around bottles of water (ahem, and cans of gin-in-a-tin), extra layers, cameras, and kids too! 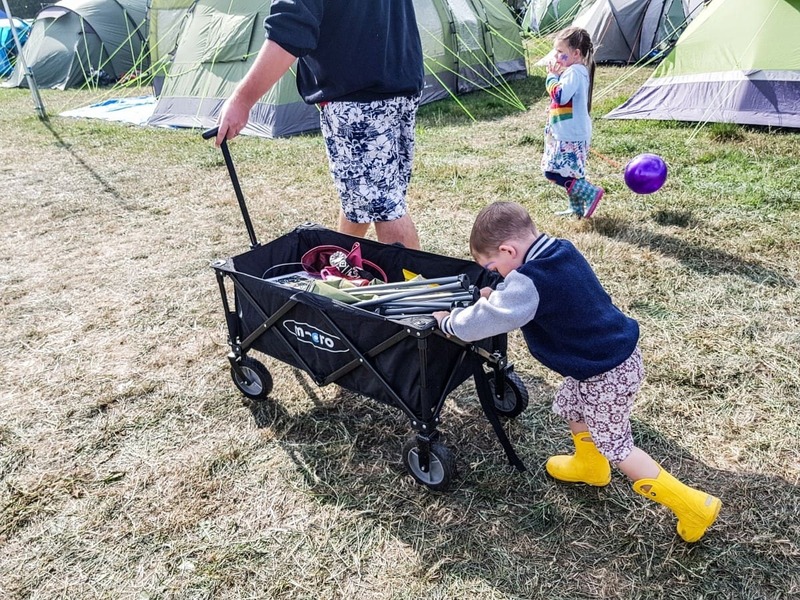 You’d be daft to take kids to a festival without a trolley – they are play things, transport for long walks and make-shift cots too. One family we chatted to said they put their one year old to sleep in their tent in theirs as it keeps him off the ground and stops him from rolling around! 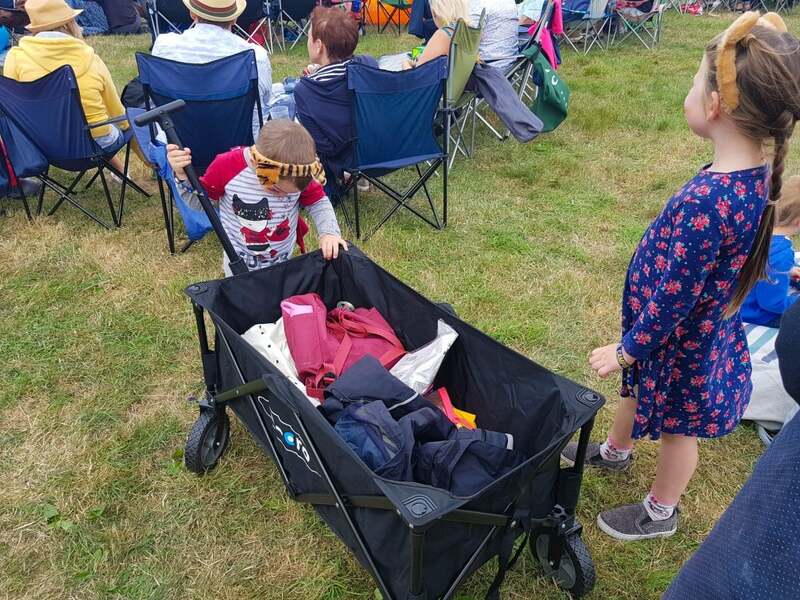 We’ve also used it for trips to the beach, it’s a 15 minute walk for us but when you want to take a cool bag, chairs, towels, buckets and spades you soon feel like a cart horse so popping everything in the wagon is so much easier, and the kids love to take turns in pulling it! Lastly we’ve used it at car boot sales, it’s great to chuck all your bargains in and avoid having to make trips back to the car with the arm fulls of kids books and toys that the we inevitably end up buying! If the handle was round rather than T shaped it would be more comfortable to pull when fully loaded. Both Sam and I felt the T-shaped handle was a bit uncomfortable when we were lugging heavier loads of equipment to and from the car. Because of the way the handle is moulded there is a seam where the two halves join which rubs a bit with a heavy load as you have a finger either side of the main handlebar (see photos below) though it’s fine when you’ve just got bags or one kid in! Storage pockets would be great – we noticed a few trolleys at one of the festivals had these on the front and back, and were great for drinks bottles and smaller bits. Even with the things that could be improved we are so impressed with the Micro Wagon, as are others who have seen us use it! You can purchase it directly from Micro Scooters or from Amazon. If you want to know more about the classic scooters that Micro Scooters make then read my review here, and see how easy it is for Arlo to use them at only 18 months! As part of our microscooters ambassadorship we were given a Microwagon to review. This is such a good idea! I love that you use it for every day transporting too, at least that way you get your money’s worth. It’s much cheaper than I was expecting it to be too, really good value! Yep! It definitely won’t be in the loft 9 months out of the year like the rest of our camping gear! !